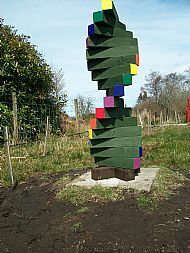 Tarbert Castle Heritage Park now has a sculpture walk within its Community Woodland. We already have considerable scenic, historic, and diverse natural habitat interest, and wish to add to this with a creative element. 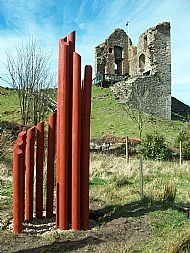 It's intended that site-specific works be created as contemporary responses to the natural, historical, and cultural heritage of the area. 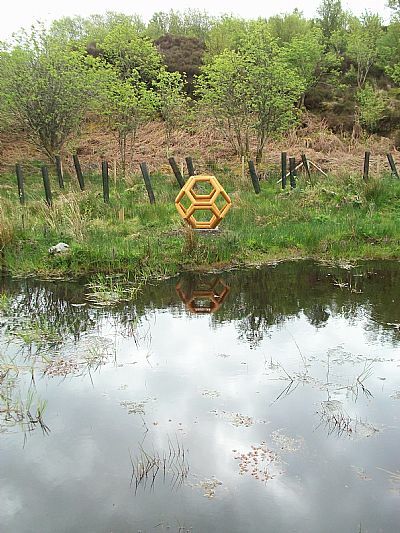 Suitable locations have been determined and commissions are proceeding, with seven pieces installed to date. Fundraising is under way. Please contact us if you wish to make a contribution or to express your view on the proposal. Meantime, watch this space! The single path labyrinth is an ancient mistical pattern the earliest known example a rock carving in Luzzanas Sardinia c.2000BC. Follow the path to the centre and find yourself. The spiral form seen in many natural objects from shells to galaxies. The helix is at the very core of all life in DNA's double spiral. The colours are the visible spectrum as seen in a rainbow.